The out CNN anchor did not mince words when discussing fearmongering around the migrant caravan. On Monday night, out CNN anchor Don Lemon commented that white men are "the biggest terror threat in this country" during a broadcast discussing the Kroger supermarket shooting and an incoming caravan of 5,000 migrants fleeing violence in Central America. 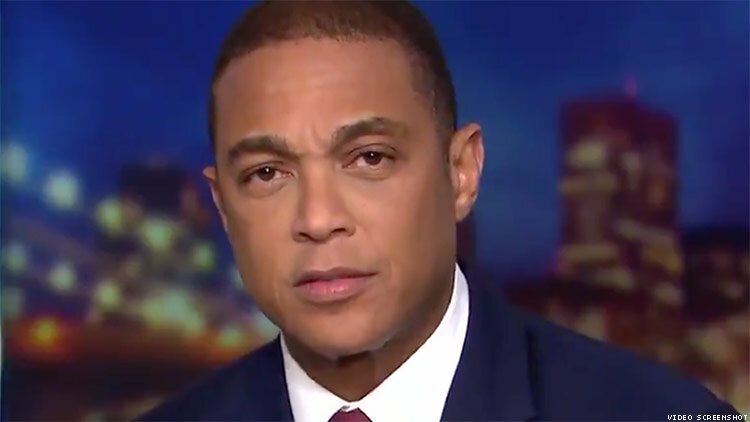 “I keep trying to point out to people and not to demonize any one group or any one ethnicity," Lemon said while discussing the killing of two black people by a white man in Kentucky. His actions are being investigated as a hate crime. He then referred to the fear surrounding an incoming caravan of migrants from Honduras, El Salvador, and Guatemala heading for the U.S. border to seek asylum from violence in their home countries. "But we keep thinking that the biggest terror threat is something else, some people who are marching, you know, towards the border, like it’s imminent. The last time we did this, a couple hundred people came and most of them got tuckered out before they even made it to the border," Lemon explained. "So we have to stop demonizing people and realize the biggest terror threat in this country is white men, most of them radicalized to the right, and we have to start doing something about them." According to a 2017 report from the U.S. Government Accountability Office, out of the 85 fatal attacks carried out by extremists in America since September 12, 2001, 62 were committed by far-right extremists, as compared to 23 by radicalized Muslims. "There is no travel ban on them. There is no ban on — you know, they had the Muslim ban," Lemon said. "There is no white guy ban. So what do we do about that?" While some claimed that Lemon's comments where anti-white, others noted that his comments focused on white men being radicalized toward violence. He didn't say an entire race was a problem. He said white men radicalized to the right. That isn't a race, it's a demo. As far as mass shooting stats and serial killers go, the data supports his comment. Lemon has also responded to the offense taken at another segment, noting that the vast majority of attacks have been carried out by far-right extremists, yet Muslims have faced demonization at higher rates. "For every eight attacks by right-wing extremists, there were one for left-wing extremists. Those are the facts," Lemon concluded.